Writer’s Quote Wednesday: frat boys or super villains? My quote this week should have been from John Oliver, who asks: “How is this still a thing?” Alas, Oliver wasn’t alive in the 1800s and he is not a writer. Because it’s Writer’s Quote Wednesday and I want to talk about fraternities. 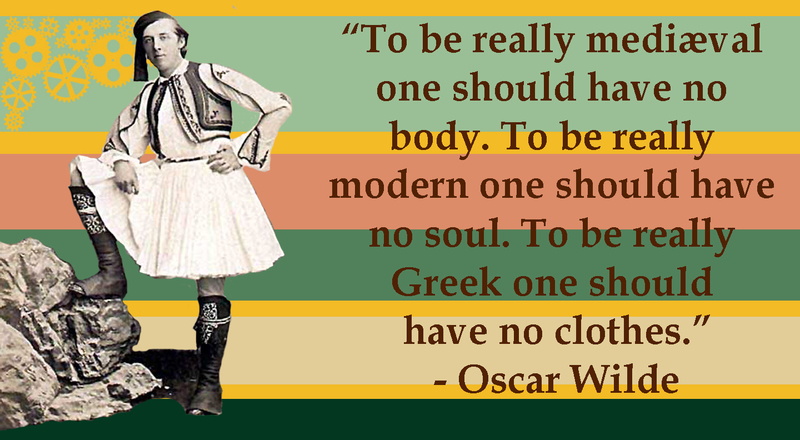 I’ve selected a quote from Oscar Wilde. Wilde was a member of the most famous and, perhaps, respected fraternities, the Freemasons. He liked the secrecy, dress, and ritual of freemasonry, joined the Apollo Masonic Lodge at Oxford, and was quickly promoted to the “Sublime Degree of Master Mason.” He valued his membership as a freemason so much so that he was reluctant to leave the Protestant faith because of it. Before beginning my research, I knew of the Freemasons, but didn’t really think of them in the same way that I think of school fraternities. Now, that I have, it seems obvious, but before I began looking into the subject, I thought of the Freemasons as an extremely secretive organization of Protestant men, bound by honour, tradition, and myth. My opinion is admittedly biased against fraternities, having experienced first-hand the same kind of sexual violence they are now famous for. In seeking balance, I’ve tried to find their appeal and imagine that supporters of Greek Life sought what the Freemasons represented in my imagination: a bond of honour, tradition, and myth. I spent part of my afternoon speaking with a respectable former frat boy (the term ‘frat’ originated in 1895). He had nothing but good experiences with belonging to a fraternity and felt that he was able to contribute to both his school and its broader community in a more meaningful way than he might have otherwise, unless, of course, he joined another of his school’s clubs that didn’t charge dues and had a mandate of giving, like the United Way, or numerous honours societies. I asked him if he is concerned with the reputation members are getting from association with the terrible acts that are being reported in the news, and he said that he was. I wondered what compels young men to continue joining such organizations, then I attended a lecture on representations of masculinity in superhero films, which talked about the rise of hyper masculinity since the 1950s, which, I noticed, parallel shifts in the history of fraternities. Fraternities experienced a rise in membership along with the rise in university enrolment after the Second World War, which lead to the introduction of hazing in the 1950s, which is when cinematic superhero history began. The superheroes of the silver screen are overly preoccupied with proving their manhood and impressing their fathers, while disassociating themselves from anything even remotely feminine. Frat boys take pride in joining the same fraternities their fathers participated in, while hazing can be viewed as an exercise in proving one’s manhood. Dr. Kara Kvaran said that to qualify as a superhero one needs to be two of the following: (1) performing heroic acts for a community; (2) in a costume, or with a hidden identity; and (3) possessing superpowers. Those sound like the things Oscar Wilde loved about the Freemasons, costumes, rituals, and secrets. This leaves me with the question: if frat boys want to be like superheroes, why do they consistently do such terrible things? I asked the former frat boy that I was talking to today what would be lost if fraternities ended. Is there anything about fraternities that is worth preserving? He couldn’t think of anything that you couldn’t get by joining any other student clubs, which do a lot of fundraising and charitable acts. If there is an answer to my question, I imagine it must have something to do with what is valuable about masculinity, which is itself a myth. I don’t say that to be derisive; not all myths hurt us; femininity is also a myth. They are myths that many of us choose to identify with (myself included), but we create those myths with our identities. The superhero engages the myth of masculinity by protecting and providing for the communities they serve. Yet, I fear fraternities have become something those communities need to be protected from.